Under the leadership of H.E. Recep Tayyip Erdoğan, President of the Republic of Turkey and H.E. Moussa Faki, Chairperson of the African Union Commission, the Second Africa-Turkey Economic and Business Forum was held in Istanbul, Turkey on 10-11 October 2018. The Forum was organized by the African Union Commission and the Ministry of Trade of the Republic of Turkey in cooperation with the Foreign Economic Relations Board of Turkey (DEIK). The Forum was honoured by the presence of H.E. Recep Tayyip Erdoğan, President of the Republic of Turkey and H.E Mulatu Teshome, President of the Federal Democratic Republic of Ethiopia and Rt. Honourable Edouard Ngirente Prime Minister of the Republic of Rwanda on behalf of H.E. Paul Kagame President of the Republic of Rwanda, and current Chairperson of the African Union. In the spirit of closer relations between Turkey and African countries, and considering the substantial momentum in Turkey-Africa relations particularly since the declaration of Turkey as a strategic partner of the African Continent in 2008 and the First and Second Turkey-Africa Partnership Summits held in İstanbul in 2008 and in Malabo in 2014 respectively, it was agreed that it is prime to advance the African-Turkey cooperation and build on what has been accomplished thus far. The Forum was attended by forty three (43) African Countries, Economic Community of Central African States (ECCAS), Economic Community of West African States (ECOWAS), financial institutions from Turkey and Africa as well as private sector representatives. During the Forum, discussions spanned issues related to “Financing of Trade and investment in Africa”, “Collaboration between Turkey and Africa on Construction, Infrastructure and Energy”, “Integration efforts of Africa and Market Opportunities for Business People”, and “ Fair, Free and Sustainable Trade”. The Forum noted with satisfaction that the Turkey-Africa Partnership is growing, deepening and getting diversified and the readiness of the Turkish side to further strengthen the economic and commercial ties with African countries. 1. The Forum decided to continue strengthening the current platform for collective dialogue, consolidate Africa-Turkey traditional friendship, deepen strategic collaboration and enhance the mechanism of practical cooperation between Turkey and Africa. 2. Turkey and Africa reiterated their commitment to implement workable solutions that will increase economic resilience, sustain economic growth and decrease disparity, while improving the welfare of the people in Africa. 3. The Forum underlined the importance of trade as one of the key engine of economic growth and a strong private sector would be a driving force in this respect. 4. With a view to further enhancing commercial and economic cooperation between Turkey and African countries, the Forum reiterated its strong intention to initiate joint action plan to examine possibilities of removing tariffs and other obstacles to trade that would be based on asymmetrical model enabling African countries to protect their sensitive sectors. 5. Taking into consideration that Turkey has shown remarkable performance with its steady growth over the last decade and being a major economic power in the region, Turkey expressed its readiness to share its development experience in different fields with African counterparts in order to broaden and strengthen the cooperation and trade relations among themselves. 6. The Forum reaffirmed the critical role of the private sector in economic growth and development by generating decent employment in order to create greater opportunities for all, reduce inequalities, raise basic standards of living and ensure environmental protection. In this regard, the Forum underlined the necessity of supporting the private sector activities in Turkey and African countries in order to foster mutual investment and trade in each other’s countries. 7. The Forum reiterated its position to prioritize infrastructure cooperation within the Turkey –Africa Partnership and strengthen cooperation in transport, electricity, energy and other areas of infrastructural development within the framework of Agenda 2063 and its flagship projects. 8. To support African Countries in reducing energy costs and increasing access to electricity, decreasing transport costs, boosting intra-African trade, ensuring water and food security and increasing global connectivity; Turkey and the African Union will work together towards establishing a partnership in the design, inspection, financing and management of projects under the Program for Infrastructure Development in Africa (PIDA) and The Presidential Infrastructure Champion Initiative (PICI). 9. The Forum recommended the participating countries to take necessary measures to encourage Turkish and African enterprises as well as financial institutions to expand investment and participate in infrastructure projects through various means, such as Public-Private Partnership (PPP) and Build-Operate-Transfer (BOT). 10. The Forum underlined the importance of trade as a catalyst to significantly increase investments, transfer of know-how and the possibility to exchange knowledge and experience on issues related to development. 11. The Forum expressed its support to the Agenda 2063 of the African Union and the 2030 Agenda for Sustainable Development of the United Nations, based on inclusive growth and sustainable development of African countries. 12. Noting the importance of the contribution of investments to capacity building in the socio-economic sectors, particularly in the human resource development, the Forum agreed to encourage mutual investment in order to build more diversified economies both in Turkey and in Africa. 13. The Forum agreed to enhance information and experience sharing on investment policies, opportunities, regulations and recent economic developments and fields of cooperation in order to create more enabling environment for mutual investment. 14. 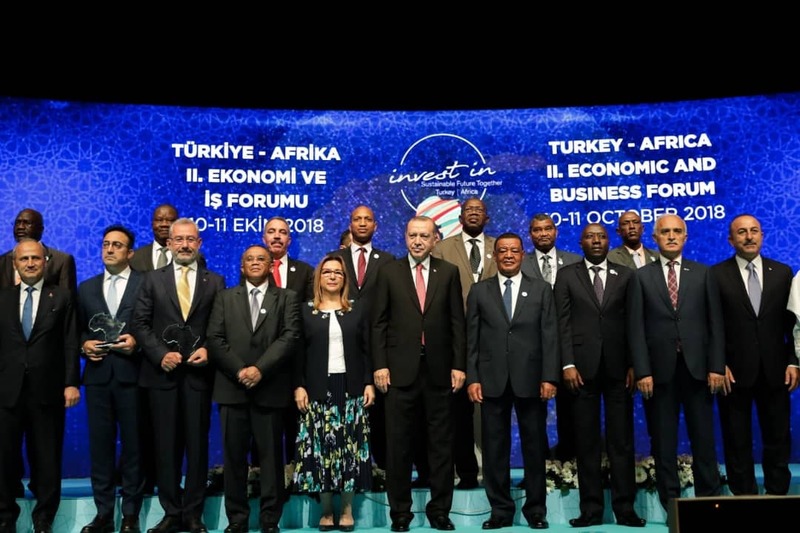 The Forum welcomed the increased investments in the infrastructure, construction and energy sectors, leading to a substantial expansion of Turkish investment securing the long-term sustainability for economic development in Africa. 15. The Forum encouraged the private sector to invest in agriculture, electricity production, transmission and delivery facilities and services, aviation, maritime, education and health as priority areas, especially in small and medium scale enterprises development. 16. The Forum underlined the importance of enhancing Africa’s manufacturing capacities through the establishment of regional manufacturing hubs as a means to increase intra-African trade. 17. The Forum called upon Turkish and African financial institutions to enhance their cooperation, including opening more branches in their respective countries. 18. The Forum recognized the important role of the African Union in promoting the integration of Africa. 19. The Forum welcomed the signing of the Memorandum of Understanding between African Union Commission and the Ministry of Trade of the Republic of Turkey on Trade and Investment Cooperation as an important milestone of the Turkey-Africa relationship. 20. The Forum underlined the role of public communication for raising awareness on the benefits of the partnership. 21. The Forum expressed its satisfaction on the achievements of mutual beneficial results and agreed to hold the next Turkey-Africa Economic and Business Forum in 2020. 22. The Forum expressed its sincere appreciation to H.E President Recep Tayyip Erdogan , the Government and the people of the Republic of Turkey for the warm welcome extended to all delegations during the event. Commission and the Ministry of Trade of the Republic of Turkey for successfully organizing this important event. Done in İstanbul on 11th October, 2018.